Wonderful news! I’ve finished my first marathon! YES! 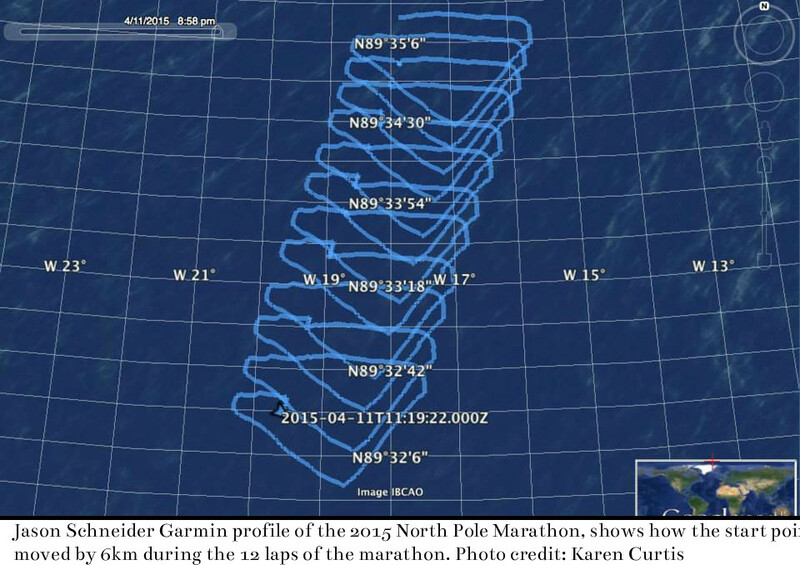 The North Pole Marathon, literally the coolest marathon on earth. The competition took place on April 11th 2015 near the Barneo North Pole Ice Camp (situated at about 60km from the geographical North Pole). The temperature fluctuated between -30°C and -41°C and we were running in around 30cm deep snow. 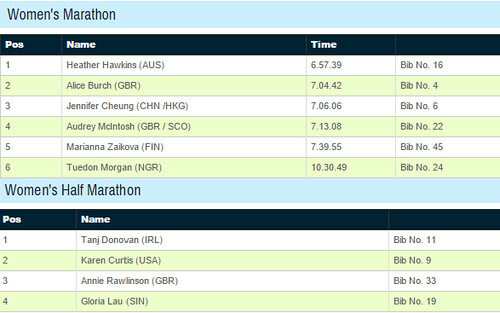 I’ve managed to finish on the 6th position out of 43 competitors, within a time of 6 hours 48 minutes and 3 seconds. A great time, great position, great race, great meetings and of course “a personal best” as my friends from the marathon liked to call it. Thank you everyone for supporting me during these past nine months! Without your support it wouldn’t have happened. And for those who want to know more about this amazing experience, let me describe you my adventure (take a seat, it might be long). Everything started in August 2013 in the Mont Blanc Mountains at a 4810 m altitude. It’s up there where Bogdan, my best friend, joked and told me that the next adventure would be the North Pole. 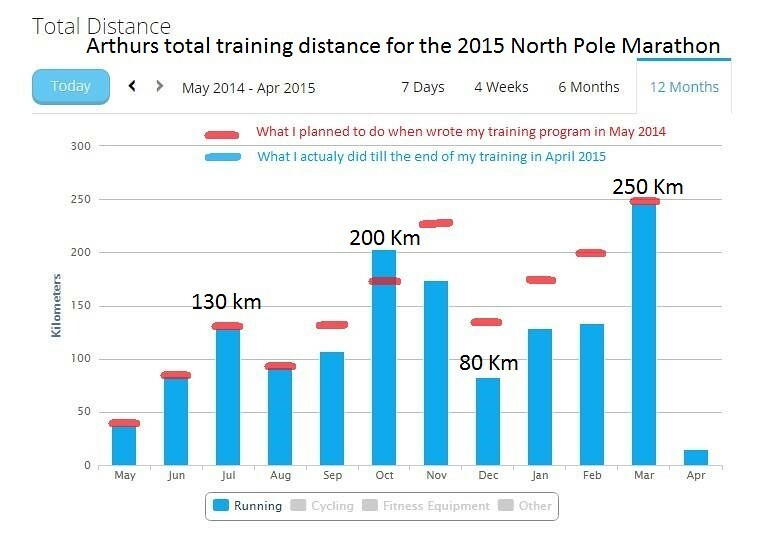 I didn’t need too much time to take the challenge and in June 2014 I registered for the 2015 North Pole Marathon (the “cheapest not-so-cheap” way to get to the North Pole). Next? Nine months of hard training, that’s the price for saving some thousands euros. 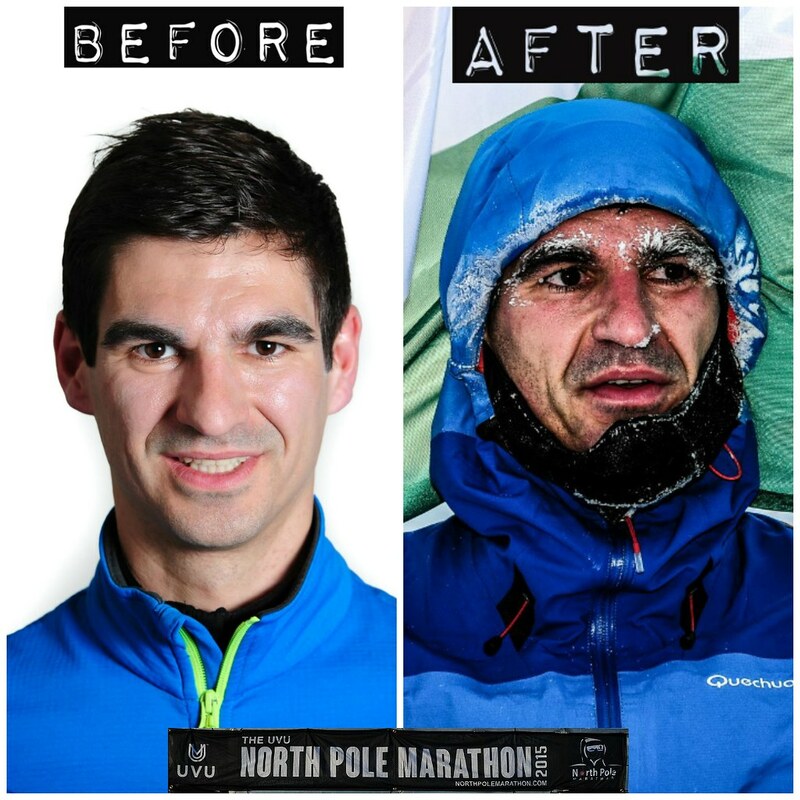 So, I learned how to run, I trained and I trained and on April 1st 2015 I left France for my first ever marathon (at this point I forgot that the goal was to get to the North Pole, it was more about the marathon). One stop in Stockholm, another one in Oslo and on April 6th I arrived to Longyearbyen, Norway – the gathering place for all the runners. Longyearbyen is a small town in the Svalbard archipelago and it is the world’s northernmost settlement of any kind, with around 2,000 permanent residents (more about: link). While we were waiting for our departure to the North Pole for our epic marathon, we had the pleasure to try some local activities such as ice caving, dogsledding, museums, sightseeing, snowmobile expeditions and of course checking out local bars and restaurants. We were meant to fly towards the North Pole on April 8th but due to some technical problems we were delayed for one day. And the next day we were delayed again, and again, and again…. We finally took off on April 11th in the morning, annnnndddddd….. There are no words to express the feelings you have when you stand up, literally, on the top of the world! Only in the moment when the Russian plane landed on the ice floes I realized were I actually was. When the plane doors opened I had this feeling that we would not be welcomed out there by the weather (imagine a temperature switch from +25°C into the plane to -30°C outside). But once I stepped off the plane, under the astonishing clear blue sky, dazzled by the magic brightness of the blended snow and sun, I felt like…well, like HOME. There was an instant connection with this place, the purity of the landscape, the simplicity of the beautiful nature, all these smiling people, happy to see us arriving after a long delay due to bad weather, the “craziness” of everybody realizing they just stepped on the top of the world, cameras, photos, hugs… Yes, I felt HOME, happy, grateful to be there and eager to run on this fabulous “land”. We were at the Barneo Ice Camp, a private Russian temporary base established only for the month of April (more about: link). The Russians are very welcoming and when you see what they constructed in these extreme conditions you have a feeling of admiration. We were taken to our tents, and there: SURPRISE! A 30M² space, heated at +25°C, ten comfortable bunk beds, one for each person. Luxury when you think that you are at about 60 km from the geographical North Pole. We started to calm down when we were told by Richard Donovan (the race director, first man to run a marathon at the North Pole, an amazing guy … google and follow him as he’s unstoppable in tracing new boundaries), that the race starts in 3 hours. PANIC! Let’s eat, let’s unpack, let’s test our gear, let’s take some more photos, figure out who’s going to test the toilets (accessible only with a gas mask)…after a few minutes everyone managed to figure themselves out. I had some of the Russian cheese, sausage and bread, added some bananas and one bag of disgusting dehydrated pastas (never again), prepared my gear, tested it, prepared my changing gear, all the food for the race and I was ready to go! I trained for nine months for this first ever marathon and even if I obviously didn’t know what to expect I knew I was ready for it! But during the week before the marathon, when we were all in Longyearbyen, I had a talk with most of the participants. I also read all the official presentations on the NPM website (link). I felt so little amongst all these runners. Most of them had already run the Antarctica Marathon and had some experience in the field. In my mind I was there to finish in top ten, but after all these talks I was wondering if I was going to be able to finish all the 42km… I was scared! 15 minutes to the start. Richard called us for the briefing, showed us the tent and the place where we could put our food. The last 10 minutes, everybody was getting ready. “Come, come, let’s start” … And there I was at the starting point, thinking at how lucky I was to be in one of the most inaccessible places in the world and that the most important thing is to finish… FIVE! … Will I finish? How many times should I stop? … FOUR!!! … it’s getting very cold, I don’t really feel my fingers … THREE!!! … Someone put his hands under my armpit to warm himself up… TWO!!! … I feel the adrenalin … ONE!!! Goooooooo!!! We were 43 people and two huskies in the starting blocks, the organizers prepared 12 loops of 3,5 km with the possibility to stop in the mess tent every lap. The track was formed by 30cm deep snow and the underfoot conditions were strange, you never had the same foot placement ever, the temperature was around -30°C and the sun was shining like it never did. 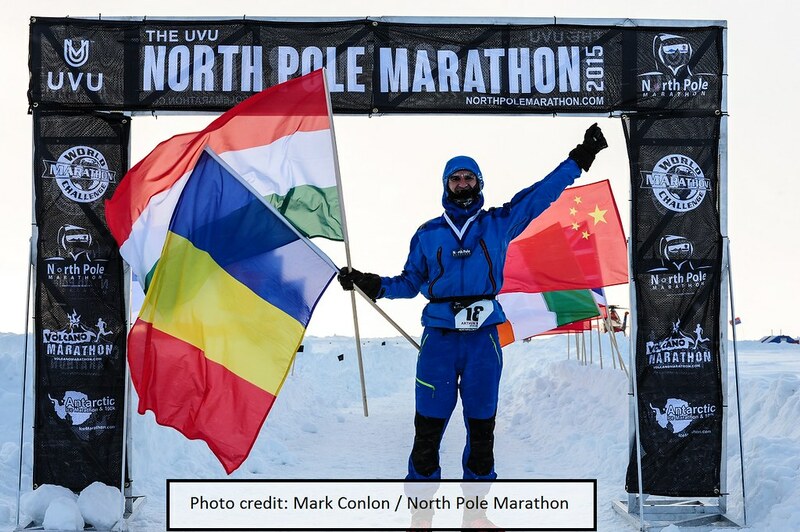 Rob de Castella, multiple Commonwealth Games champion, former World Marathon champion and mentor of The Indigenous Marathon Project, was the official starter of this year’s North Pole Marathon. I started amongst the last ten runners, slowly, testing the track, watching the runners. Three minutes after the start the fog inside my googles froze, it became impossible to use them, and even if I was afraid for my eyes, I took them off and I continued running. After the first lap I left my googles into the mess tent. ONE LAP and I was feeling so good, ready, happy, and full of energy. It was a strange feeling, I never had it before. So I started to run a little faster. WOW! I’m feeling so good. I didn’t really know what position I was in and I didn’t care. 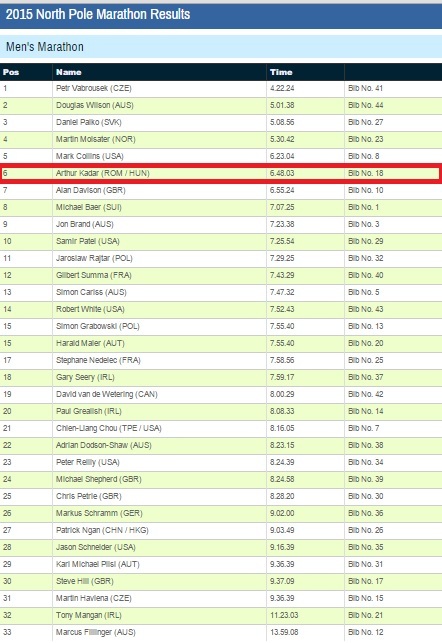 I hadn’t passed by a lot of runners so I thought I should be on the 20th position. Great! There should be time to change my gear before it was starting to freeze on me. I was approaching the first half of the marathon. Passing the line Richard tells me: “Good job Arthur!” You’re on the 4th position. Whatttttt? I didn’t understand. Did he tell me I was 4th or that I’ve done 4 loops? In any case it seemed impossible, I couldn’t be this fast and I had already done six laps. I thought “I’m stopping to drink and eat something… but if Richard is right, and I’m 4th it’s my chance of glory! I’m still feeling good! No time to change the gear, I have to keep this position so GoGoGo!” Call me nuts, crazy, insane or whatever you want, but I wanted to win this race! I remember my first times jogging nine month ago, I was exhausted after 30 minutes run. I never liked running, it was a challenge and I took it like one. I forced myself to train. Some weeks I was so sick of running that I wasn’t even looking at my running shoes. All these nine month of training were a pain, not because I didn’t like the sport but because running for two/three hours every three days, all alone, was very boring… the only fun part of the training was when I trained myself into a freezer at -20°C (thank you so much Frédéric for letting me run in you warehouse). Great experience that helped me to test all my gear before coming to the Pole. I knew how my gear would react in time, when to change it, I knew at what temperature I should add one more layer, I was a real expert in running in the cold. But we can never predict the unpredictable … And here I go for the 7th lap, great lap, I’m feeling awesome, I’m starting the 8th lap…something is happening, no more sun, Is it snowing? No! That’s the wind! What is happening? I’m feeling cold, my gear is not flexible anymore, hmmmm, it froze! WOW! I’m not feeling well anymore! I have 3 km till the next lap, till the mess tent. My legs are heavy, I feel pain and I’m shaking. Can’t run, I’m walking. Stephane a French runner is passing by: “are you ok?’ … “yes, need to finish this lap” … I try to keep up with him … lot of suffering on my walk, scared that I’m not going to be able to finish, all those thoughts passing by my mind: “Stop Arthur! Stop!” … look, there’s the mess tent, I’m starting to run with all my last powers, I don’t hear anything around me. I’m getting into the mess tent. I find a chair and sit down. Dennis Andrade was the official doctor of the race. Every time I was entering the tent he was busy helping somebody to recover from hypothermia or treating some frostbites. It was incredible how much the runners stopped for treatment. I heared somebody around saying “the temperature dropped at -41°C”, everybody was in alert. I was scared not to be stopped from the race, so I stayed calm and ate all the food I had (2kg bananas, cookies, one lemon, energy bars, dehydrated fruits, nuts and one Kendal Mint Cake offered by Annie, one of the amazing runners in the competition). My gear was completely wet, I needed to change it. But my legs are too heavy, can’t walk properly … with a last effort I’m getting into my tent and change my gear near a heat blower… 45 minutes have passed since I stopped, my 4th place is lost, pffff…. But I don’t care! I’m here to finish, not to win! The food and the heat started to make me feel better. I’ve probably been in hypothermia, but I’m feeling great again. I added two more layers on me to face the wind and I left for the 9th lap…. WOW! I’m feeling really great. I’m running faster than in the first half. Wow! I’m confident now! I’m going to finish and I don’t care anymore in what position. I’m just going to have the best run of my life. And I’m doing it, I stop every lap in the mess tent to see how people are going, I’m taking my time to drink some boiled water (melted ice actually) and I’m just feeling good. I don’t count how many laps are left but how many I’ve done and I know that this is a sign of “going good”. If I’m doing so good on this marathon is probably because my training was totally created for this event. Slow workouts, sand training, freezer training … as it was my first marathon I can’t say in what time I could finish a regular one, but probably I’ll finish way behind all these runners. Actually it was more like an ultra-marathon so if you want to try out the coolest marathon in the world don’t train like for a regular marathon. I’m hearing Richard and Fearghal (Fearghal Murphy, co-organizer of the North Pole Marathon and a great storyteller, great man): “Go Arthur, last lap! You are doing great!” WOW! I’m still feeling so great! One more stop into the tent, losing one fleece and getting ready for the last lap. I’m like a rocket! I’m running like I’m followed by a polar bear! What a speed! I’m so happy that I can’t stop running fast! Emotions, endorphins, tears of happiness… There’s the finish line!!!! Yuhuuuuuuu ……. I lost all my words, I was literally lost, I can’t believe I’ve done it! Flags, cameras, medal, hugs …. Emotions! Incredible is a word that could describe it, but it was much more than that. It was actually unreal, I still don’t believe that I did it! Back into the tent I was waiting for the others to finish, and during this time I was helping Dennis and Kate with the patients (frostbites, hypothermia, numb toes), doing the best I can. All the runners that finished the race were helping in a way or another. I was waiting for Mr. Hill, Steve Hill, to finish but I saw the weather was getting worse so I decided to get on the track to help him with the last kilometer. The track was unrecognizable, the 30cm deep snow transformed in 50cm deep snow, it was impossible to run. I admire all the participants that succeeded to finish this race in these conditions! What a performance! It was hard for all of us but now I know there are no great achievements without great risks! Four participants finished the half marathon and all the others finished the whole marathon! BRAVO!!! Nobody knew the time or the position on which they finished. 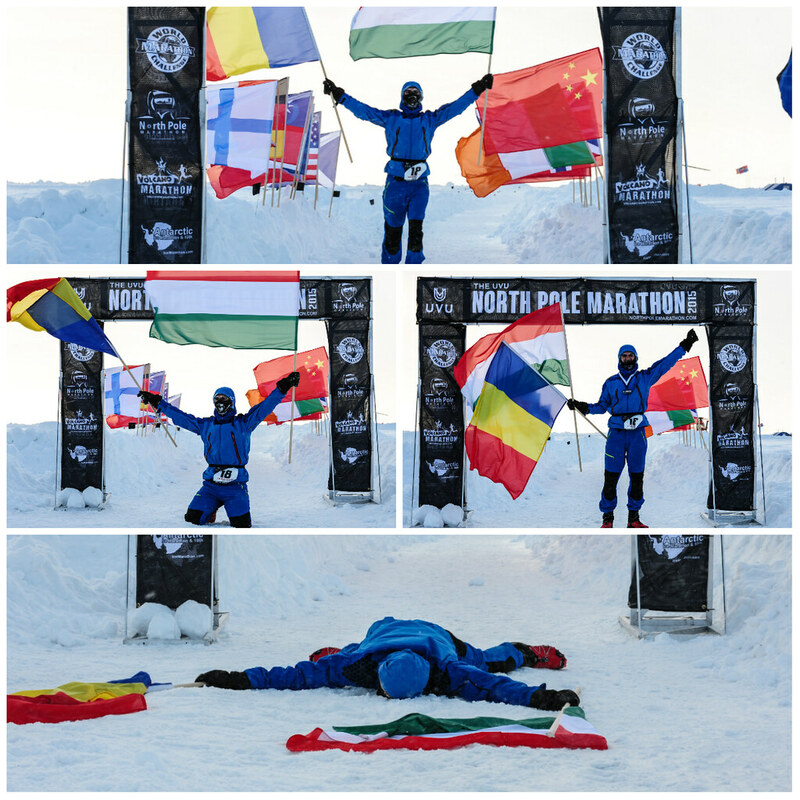 We got the results once we were back in Longyearbyen, directly on the North Pole Marathon Facebook page. But who cares about the time or the position? WE DID IT! And that’s the most important! WE ARE ALL CHAMPIONS! But you might ask yourself why I did it? At first it was that eager desire to get to the North Pole. Then, once I found out about this marathon it became a personal challenge. The challenge to achieve something which seemed impossible! Why impossible? Because it involved lots of money that I didn’t have, because at that moment I wasn’t able to run more than 30 minutes, because the last time I’ve been to -10°C I swore myself to never expose my body to such an extreme temperature. Not to mention that there were only a few people who believed in me at the beginning. So this is why! Just a challenge! What are the risks and how do I limit them? How to keep a balanced life (challenge, family, friends, work)? It’s interesting how the danger and the unknown can stimulate the brain and the imagination. Once I had all the answers it was “just” a matter of motivation, ambition, will and mental! First of all, the encounters I’ve had out there, such wonderful people, with such amazing stories. Their lives inspired me and made me feel so little at the same time. Most of them were running for charities, raising awareness for different health programs. It’s something that touched my heart, because I’m still trying to figure out what my contribution to the world would be. And I’m starting to get some answers. I can really say that I’m a new man after this experience! I confirmed to myself that I have great analytical and organizational skills. I discovered that my brain has a need to get creative, to imagine solutions even for the most difficult problems. I also discovered that I’m very competitive and this competiveness almost made me drop out in the middle off the race. That’s a great lesson I’ve learnt and hope to manage that feeling better in the future. I know now I’m an ordinary person, with ordinary physical capacities, but what makes me special is my ambition and my mental strength. But what I love most is this feeling of being invincible, being able to do anything, to set new limits, the belief that nothing is impossible anymore. I think it’s called CONFIDENCE! Well, I take life as a challenge itself and I’ll quit my job in France. I will give up the security, the comfort and the reassurance of a quiet life. I choose to embrace incertitude and I’m going to follow my girlfriend in Sweden, as I feel this will give me a much-needed fulfilment. I love this new challenge of learning a new language, of getting a new job in such a different culture and of course of SUCCEDING! Because that is what I’m good at, SUCCEDING! ← TOGETHER at the North Pole! So happy I read through your gutsy report! All those who attempted this crazy marathon are heroes….those of you, like my son Mike, who took it as a self challenge and opportunity, are….in my eyes….monumental!! Thank you for sharing your experiences, and good luck with your future ventures, whatever they may be! Congratulation Arthur for your achievement. I am sure that a long line of achievements will follow. And if i may add to what´s make you special is your positive attitude. I remember you as a child and this is the best way to describe you: a positive person. Keep on spreading your positive energy. Bravo Arthur, that’s fantastic! ‹‹Je suis même allé au Pôle Nord›› is quite an understatement ;0) I wish you all the very best as you continue to pursue and propagate positivity!! !